Recycling can mean a whole lot more than just using your blue bin, and our Bazura Bag Collection is a testament to the wonders of upcycling! Bazura Bags are made by a Women's Co-operative in the Philippines. All products are made of used juice containers, recycled rice bags and discarded advertising banners! Whether you're in need of a shopping bag, lunch bag, pencil case, purse, or even a luggage tag, Bazura has got the pouch for you. Take a peek at some of the different Bazura Bags below! Don't think that just because we are taking about bags that we forgot about buttons! 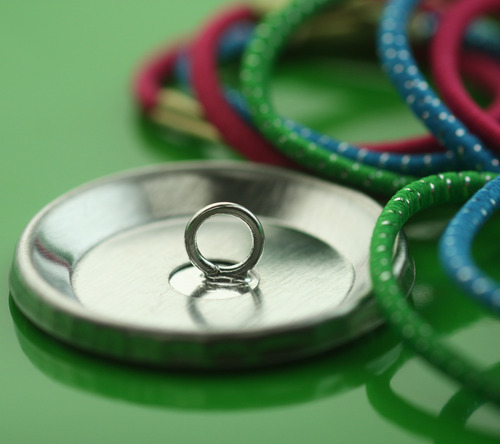 Each Bazura product comes with a bonus custom made People Power Press button pocket mirror, button bottle opener, button zipper pull, or button keychain. All greeting cards measure 4 X 5.75", are blank on the inside, come with a white envelope, and a stylish pinback button that's ready to wear. Swing by the shop at 3095 Dundas Street West, or shop online at peoplepowerpress.org for all of your holiday button needs! This easy to use DIY tool is an awesome addition to any music-lovers' collection, and is a great gift idea for a guitarist on the go! To use, just round up some old gift cards, credit cards, or even sturdy plastic packaging and make a one-of-a-kind guitar pick with a single punch! This heavy duty little machine is also great for band members who want to give out or sell personalized guitar picks at shows. Also great for music lovers, check out our Music Makes the World Go 'Round button packs in bright and neutral tones! Halloween is almost here, and we are oh-so ready to play some tricks, eat some treats, and have some fun with with Spooky Face Dry Erase Buttons! Simply draw a face and then erase! Repeat as many times as you like! If you come up with the the BEST FACE EVER you can make the design more permanent by using wet-erase or permanent markers too. Spooky Face Dry Erase Buttons come in lots of fun and colourful designs: witch, cat, pumpkin, mask, and Frank! All are available as single buttons, or you can collect the entire Spooky Face Button family. You can even get have a custom collection or button designed for you by our team! The possibilities are endless. Just give us a call! Want to teach your button machine something versatile? Try Versaback Zipper Pulls! Zipper pulls are perfect for backpacks, pencil cases, suitcases and gym bags! But they don't just pull zippers! They also make great keychains, ID tags, decorations, luggage tags, and even gift tags! Zipper pulls work best with Versaback inserts which are compatible with standard 1", 1.25" and 1.5" parts for Tecre and Flex machines. If you're already rocking Versabacks in your machine you can find "Just the Pulls" here. What's that!? You can now order custom printed stickers to match your buttons! Check out this slick combo for Toronto-based band NLP! Would your button order look awesome on a sticker too? You can add stickers to any custom button order. What a great way to promote your band or business! In Keychains 101 - Part 1, we talked about the difference between versa back and slot back keychains. Now we're ready for the fun stuff! The Loop Keychain is one of the fancier styles, but it's also really practical. Available for 1", 1-1/4", and 1-1/2" buttons, the Loop can be used with just a Versa Back (pictured above), or with a jump ring. (We recommend the jump ring for easier assembly and our kits do include the jump ring). The Snap Hook Keychain closes with a hinged snap hook (sort of like those airtight swing top jars). This type of keychian is available for 1", 1-1/4", and 1-1/2" buttons and is used with a versa back. The Snap Hook is also compatible with 2" round buttons, as well as 2-1/2" X 3-1/2" rectangular buttons when used with Welded Up Eyes. If you've been into the shop over the past few weeks, you might have noticed that our storefront has been rocking a new look. 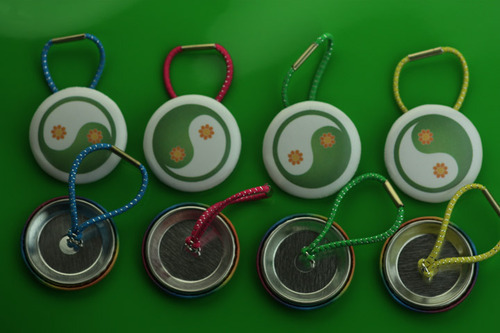 These recycled rice bag wallets are a fashion statement that you can feel good about! Add some extra personalized pizazz with a custom button key chain or pocket mirror and you're ready to take on the town! 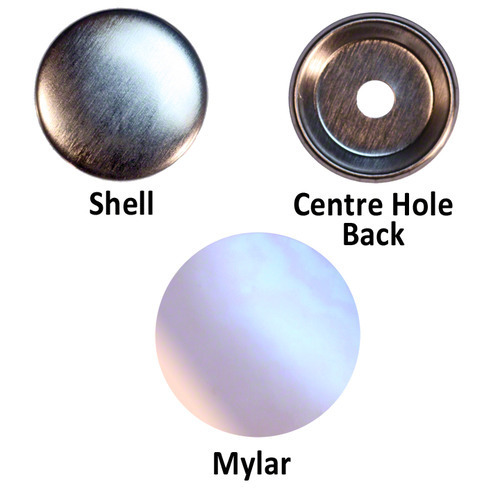 If you make your own buttons, you probably know that mylar is an important part of the button making process. Dura-Lar is a Mylar substitute that you can print onto directly. The finished products vary depending on how you chose to use the Dura-Lar, but in this case, it was used to produce stunning, super shiny buttons! Dura-Lar can be printed on in almost any laser printer. All of the colours you see are printed directly onto the Dura-Lar, and the metallic silver, is actually just the shell of the button. If you prefer neon or pastel colours over a metallic finish, we have a great selection of pre-cut paper circles. When used underneath Dura-Lar the colours really pop! Are sparkles more your thing? Check out THESE little guys made with Dura-Lar and gift wrap. they are sure to add a little glimmer to your day! You can make-a-button, and if you aren't in the creative mood you don't have to leave empty handed! Here's to Toronto. A super cool city, and home to our pretty delightful little button shop. These books have been turned into some seriously cool notebooks and sketchbooks, ready for you to fill with whatever your heart desires. All books are hardcover, coil bound, and use "Tree Free" recycled paper. So whether you like retro books, sketching and writing, or just want to reduce your carbon footprint, we've got you covered. Selling your button designs in stores can be a great way to launch your button business. But buttons are a low cost item that can walk very easily if you have them in a jar or on a board. Packaging buttons is a good way to go. You can make sets of matching buttons and put them on a display card or 4 in a bag with a header card. I will be writing a separate article about button packaging in due course. Another way to ensure you don’t loose buttons to pilfering is sell them using a button vending machine. The Northern Beaver takes 1″ or 2″ or 3″ capsules. You can fit 3 1″ buttons or magnets in a 1″ acorn capsule. You can fit 3 buttons or magnets up to 1-3/4″ in a 2″ acorn capsule. The 3″ capsules are a quarter each so I find them a bit expensive but they do take a few 2-1/4″ buttons. The 2″ acorn capsules are only 5 cents each, the 1″ acorn capsules go down to 3 cents each. I see more opportunity in those than the 3″ buttons. Put your button sales on automatic! Use a simple machine that safeguards your art and collects the cash for you. Whilst your sleeping, in the bath, in the bar. I mean it! Earn money while you sleep with your custom button designs. Custom Buttons in a Button Vending Machine - Simple but effective! What a Great Idea! Sell your own custom buttons in a Button Vending Machine. Our shop is currently loaded up with everything to get you started: Let someone (or something) else do the selling whilst you are creating your art. Stay in creative mode whilst the business side takes care of itself. Use a simple button vending machine to sell your designs. Remember those bubblegum machines when you were a kid? Well this is the same but it's not for selling gum. It's a machine for turning your designs into cash. A custom button vending machine for your art and designs - it's personal! Checkout this link. You can order just a machine or you can order a machine already filled with your designs in capsules ready to go. Put your custom button sales on automatic. You choose the sale price: 25 cents to $2. You choose button quantity 1 - 3. You choose button, magnet, key-chain, but don't forget to include your business card and a special offer or two. The silent salesman will still be working for you. If you've got good designs, we've got good button vending machines to sell them. We stock three different styles of Button Vending Machines and two different sized Capsules for your Custom Buttons. Rosettes are used for many purposes; they are great for events or as reward buttons, award buttons and as tokens of appreciation. These rosettes are hand-made in Canada and have a soft, full, plush feel and are of excellent quality. And now you can make your own!! We stock both 3" and 4" diameter rosettes. The 3" rosettes have ribbons that hang bellow. Both sizes can accommodate up to a 2-1/4" sized button. To make a rosette you need a button maker and prong back button parts: a shell, mylar, a prong back and a plastic back pin-back. 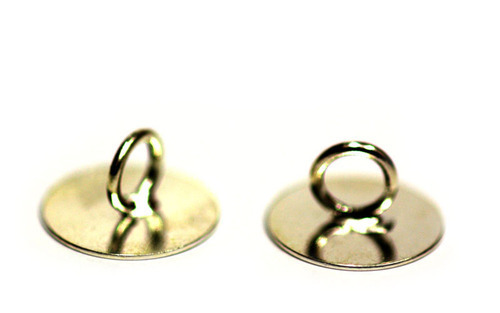 In smaller sizes (1", 1-1/4" and 1-1/2") you use a centre hole back and stick the brad prong pin. Don't worry, when you order rosettes the parts come complete. To make a rosette button you first need to make your prong back button or center hole prong back button using your button maker. Next push the prongs through the cardboard holes of the rosette and then through the center hole of the black plastic pin-back. Flatten the prongs to hold the rosette onto the button. We stock rosettes in white, red and blue but they are available by special order in 50 different colours. Special order colours may take up to 4 weeks to ship but stock colours will ship the same day. Pre-Cut Paper Circles for Button Making in New Pastel Paper! The problem is quite simple. How do I make buttons that are fluorescent? My printer cannot print fluorescent colours. How do I make gold or silver buttons? My printer cannot print gold or silver. Well the fact is very few printers can print fluorescent colours or gold. Even bright pink is difficult to reproduce so this article explains how to get around the limitations of printing and put really bright colors on a button. So if you want bright pink buttons just use this idea and substitute the gold paper for fluorescent pink or whatever color you choose. I will use the example of gold because no printer can print shiny reflective gold. Make your artwork just like you would for any button and then reverse it. Then simply print the reverse image on a transparency. Lay the transparency over a sheet of the gold foil paper and cut out the gold sheet and acetate together. If you have trouble with the gold foil you can always cut it separately with scissors and put it under the acetate. It only need show through where there is no colour printed on the acetate. You don’t even need to cut very accurately. Now put acetate with gold backing into the button maker and press as normal. Voila! Another tip is to print the image NOT reversed and lay the acetate over the gold foil print side down. This way the print side is protected. Depending on your printer and acetate combo the ink may scratch off. This way your print is protected. A printed transparency with the image showing through the clear acetate. The printer printed on the reverse of this transparency to protect the print surface. The printed sheet is placed over a gold foil sheet with printed side down but image showing correctly through the acetate. Note the photo here cannot reproduce the shiny gold as per the actual gold leaf. You need to see this button. It shines! Here we cut the acetate and the gold leaf die simultaneously using a cutting die. If you are using a graphic punch to make your buttons then cut the acetate with your punch and cut the gold leaf with scissors. Finished buttons with shiny gold showing through the acetate. A great way to make visually striking buttons. This photo here cannot reproduce the eye catching gold. Make one yourself and see what I mean. A great way to utilize a 1″ button maker to make interchangeable jewelry with FLAT BACK Button parts (sold separately: click for Round or Square). Artclix jewelery for pendants and bracelets with your 1″ button maker. You can find the bracelets here on People Power Press. Pendants here. Button bracelets available so you can have interchangeable sets of button designs on a magnetic bracelet button holder. How do you spell Jewelry Jewellery Jewelery? No idea! It is certainly confusing when writing about buttons. At People Power Press we call pin-back buttons "buttons" and we think of them as buttons but more commonly the word "buttons" refer to what do up your shirt. This is the kind of button that I am about to write about (and yes, you can make them using pin-back button supplies and a button maker). The great thing about a button maker is that it takes you as far as your imagination goes. 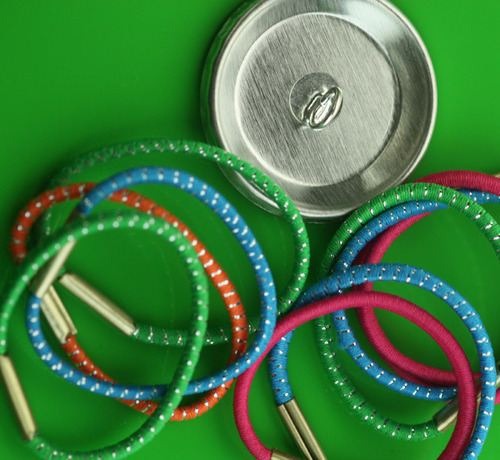 There’s so much you can do with a button maker and this article explains how to make ponytail elastics. 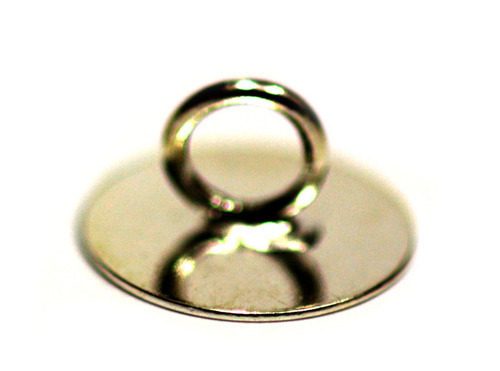 Most people make pin-backs with their button makers but center hole button parts are widely available. You need centre hole backs and then you need welded up eyes. Welded up eye – Use with center hole backs to make ponytail elastics. Once you’ve put your design on a centre hole button with a welded up eye poking out you can loop your hair elastic through the loop of the welded up eye. Bingo! Where can I buy ponytail elastics – Best bet is your local dollar store. Welded up eyes? - What are they? How do you use them? I think welded up eyes are an underestimated, under-used little accessory for button making. They are a small metal ring with a backing plate. 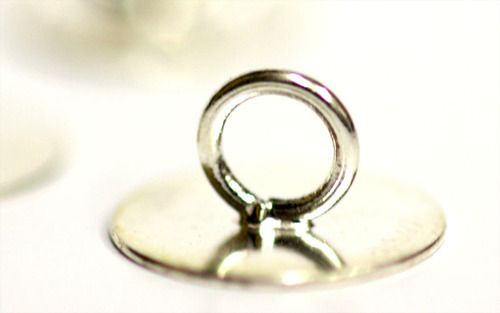 Think of any pin-back button and the holes on the back of the button: welded up eyes can be inserted through the hole in the back - pressed in the button maker for permanence and used to attach key-chain, pendant, ponytail holder or any other accessory. A welded up eye can make a button attachable… to almost anything.